No boxer has had an impact on the sport like Muhammad Ali. He is an all-time legend in the truest sense. 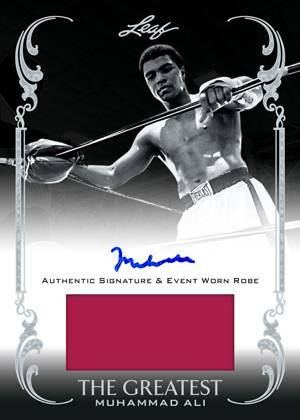 2012 Leaf Muhammad Ali the Greatest acknowledges this with an ultra high-end product that promises one on-card Muhammad Ali autograph in every box. It's not cheap, but it does fall in line with other Muhammad Ali autographs. 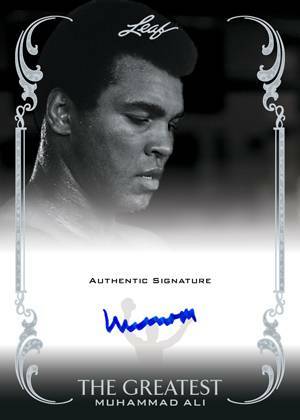 In fact, every card in the release has an Ali signature as boxes come with just one card. The cards lend to the high-end appeal, using lots of gloss and thick card stock. Like Leaf's previous Muhammad Ali products, this one uses striking images of the boxer, both inside the ring and out. Limited 750 numbered boxes, each card comes in an engraved wood box. Every third box has a one-of-one that is either a base parallel or event-used card with a piece of fight-, training- or event-worn memorabilia. 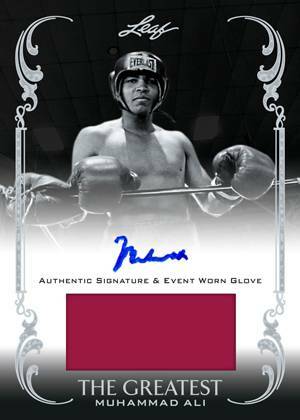 2012 Leaf Muhammad Ali the Greatest has a 50-card set of base Silver autographs, each of which is numbered to 10. Every other card in the set is a one-of-one. These include Gold, Training-Worn, Event-Worn Glove, Event-Worn Robe and Fight-Worn Trunks. This is Leaf's final Muhammad Ali set. 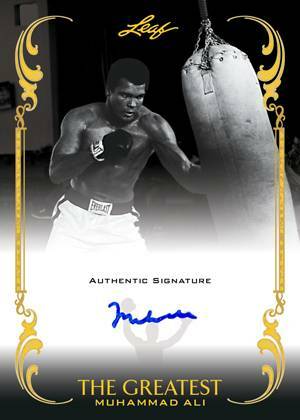 2011-2012 LEAF THE GREATEST MUHAMMAD ALI AUTO #D 10 SIGNED "NATIONAL" STAMP 1 1? 2012 leaf muhammad ali- nrmt the greatest! 50 cards in set, #/10. 50 cards in set, all of which are 1/1.